THERE is big money to be made when betting on quinellas, especially in the Melbourne Cup as the quinella pools are massive. You can also bet on the fixed odds quinella market for the 2016 Melbourne Cup at Flemington on Tuesday and we have identified four horses you will need in your quinella selections. 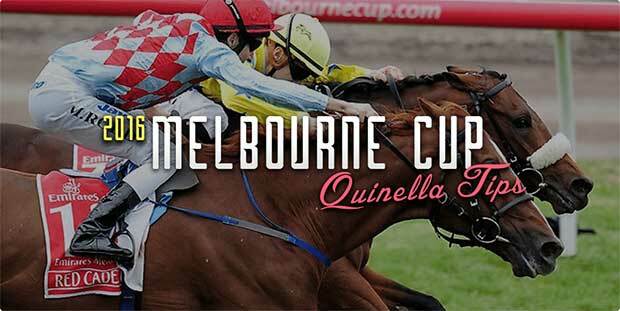 Sportsbet.com.au has released a Cup quinella market and the potential payouts are huge. The current quinella favourite is paying a juicy $21 and the long-shot punters are seeing odds of $5801 for the lesser-fancied option. There are numerous quinella possibilities, but if you include our top picks in your quinella bets, that’s half the job done. Hartnell is the current $5 favourite to win the Melbourne Cup and we believe it has a great chance of bouncing back from its Cox Plate defeat. The six-year-old kicked off its campaign with a second placing behind Winx in the Warwick Stakes before rattling off three consecutive wins in Sydney and Melbourne. During that winning streak it was able to win the Group 1 Turnbull Stakes by 3.25 lengths over third-favourite Jameka, and that form looks great for this. Punters are showing some caution because of its defeat at the hands of Winx in the Cox Plate, which is justified, but the Melbourne Cup is a more suitable race and Winx is nearly impossible to beat under Cox Plate conditions. Hartnell is a 10-time winner which can atone for a poor effort in the Cup last year, but its form has improved significantly and we believe a big run is in store. We have labelled some top quinella chances that can be paired with Hartnell. Punters have the ability to anchor Hartnell in the quinella and back multiple options to ensure a handy profit. Punters can confidently back all seven of our options that include Hartnell to return a big profit. Our top pick is the Hartnell/Big Orange combination which is at ridiculous odds of $51. Those odds are much better than a $5 and $15 chance would normally pay for the quinella, so sign up to Sportsbet to get some great odds. Big Orange is one of the top European-trained runners in the field and its current price of $15 is very generous from the bookmakers. The Michael Bell-trained gelding finished fifth in the 2015 Melbourne Cup where it set a slow pace up front, but that didn’t suit the gelding so expect a more solid tempo set up front this year. The six-year-old has come back stronger according to Bell and its form leading into the Cup has been outstanding. It hasn’t raced since July when it won the Goodwood Cup carrying 61kg, but it likes running fresh up and it will make its own luck out in front. Due to its current odds, any quinella that involves Big Orange will pay handsomely and below are our top suggestions. The best value is with the Big Orange/Oceanographer quinella at $67. Big Orange will likely set a strong tempo in front and we could see Oceanographer producing a similar effort to that of the Lexus Stakes on Saturday. Oceanographer will settle back and if the pace is strong up front, it will be finishing quickly down the outside. That could leave Big Orange and Oceanographer to square off near the line and value punters will be cheering. Wicklow Brave may have drawn the outside barrier, but punters have launched into the eight-year-old which is coming off its career-highlight win. It won the Irish St Leger by a half-length over the well-rated Order Of St George and that form will likely stack up in the Melbourne Cup. It won at the Curragh with 62kg on its back so the drop down to 56kg will help and champion jockey Frankie Dettori will be hoping to make amends for a disaster ride last year. Bookmakers opened it at $26, but price has tumbled into $15 and we believe it has the ability to run in the first two on Tuesday. So punters don’t have to spend too much, we’re only going to suggest taking four quinella bets if Wicklow Brave is your desired runner. Our fourth pick is the Wicklow Brave/Who Shot Thebarman quinella which is paying $351 at Sportsbet. Both horses are capable of running the distance and the odds are worth having a stab at. Oceanographer was brilliant when winning the Lexus Stakes and its chances of backing that up on Tuesday appear strong. The Godolphin gelding will have to back up only four days later, but it has been done and punters have backed it confidently for the Melbourne Cup. It knows how to relax in the run which is key to winning the Cup and we believe it’s a top chance for quinella success. Punters can back multiple quinella options with Oceanographer and still make a big profit. Our five suggested quinella bets are all top winning chances and there are great odds on offer.